Anti GMO person: Foods containing GMOs should be labelled! I should be able to make the decision on whether I want to eat them and not have GMOs forced on me! Normal person: So what would happen if a company sells a food product made with GMOs but doesn’t label it as such? A: The product should be pulled from the shelves and the company fined! N: And who would do the checking of products and levy the fines? A: The FDA, of course. N: OK. So you think GMOs are unsafe? A: Of course! They’re putting fish genes1 in a tomato! How can that be a good idea? N: If they weren’t safe, the FDA (and equivalents in other countries) wouldn’t allow them to be sold. They make sure that all of our food is safe. That’s why they exist. A: I don’t trust the FDA! They’re in the pockets of companies like Monsanto! N: And you have proof of this? A: Of course not, the government is covering it up! N: But it’s the FDA you want to check up on these “non-GMO” labels to make sure they’re accurate? A: People have the right to choose! 1 – there is no such thing as “fish genes”. 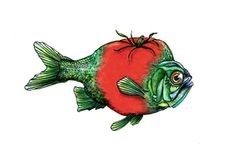 Tomatoes and fish share something like 60% of their genes already. There are genes in a flounder that have specific characteristics (a resistance to frost), and scientists are trying to give that same frost resistance to tomatoes by transferring that gene – and only that gene. Tomatoes aren’t going to start swimming or taste fishy. We already cross-breed species with the hope that a desired trait in one breed is transferred to the other, but this is clumsy and error-prone, plus this may transfer unwanted traits as well. This has been going on for hundreds of years and nobody complains. With genetic modification, we can copy only the traits that we want. It’s the same thing only much more precise. GMOs that don’t show the desired traits are not sold – this is not “randomly transfer genes, sell them to the public, and see what happens”. People try to spin the labelling argument as choice, i.e. let the public decide. But this is misleading. If you we really advocating for consumer choice, you’d be advocating for information on the packaging about which ingredients are genetically modified and the details of the modifications. But they don’t want information. All they want is a “This product contains GMOs” banner on the label. This is not about advocating choice, it’s an attempt to incite fear. But let’s say I buy the “labelling as choice” argument. People have their preferences, and many would prefer not to buy products with GMOs in them. But I have preferences as well. Personally, I don’t want to eat food grown by people with red hair. I want any foods grown by red-haired farmers to be labelled as such – it’s my choice and I don’t want to feed any ginger-grown garbanzo beans to my family. Where’s the labelling there? What are the red-haired famers afraid of? Can you prove that foods grown by red-haired farmers are just as safe as foods from a normal farmer? GMOs have studies that have lasted a decade or more proving that they’re safe, where are the ten-year studies of red-haired farmers? This entry was posted in Skepticism on January 31, 2016 by Graeme.